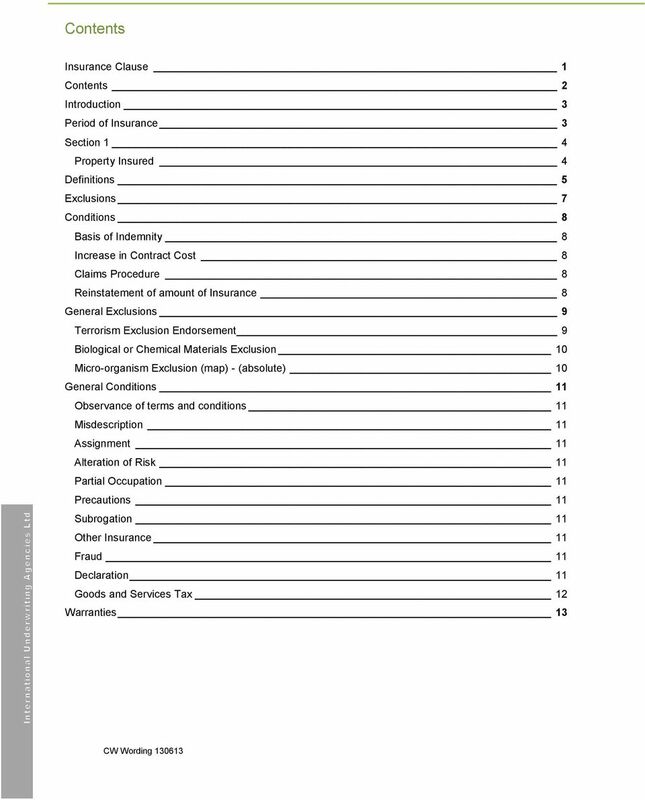 3 Introduction In consideration of the Insured named in the schedule having paid or promised to pay the required premium, Various Insurers (herein referred to as the Insurers ) agrees subject to the terms, conditions and exclusions of the Certificate to indemnify the Insured to the extent set out in the Certificate. In issuing this Certificate, the Insurers rely upon the information contained in the proposal and any statements or representations made by the Insured or anyone acting on behalf of the Insured. The Certificate and the schedule shall be read together as one contract and any word or expression to which a specific meaning has been attached in any part of this Certificate or of the schedule shall bear such meaning wherever it may appear. 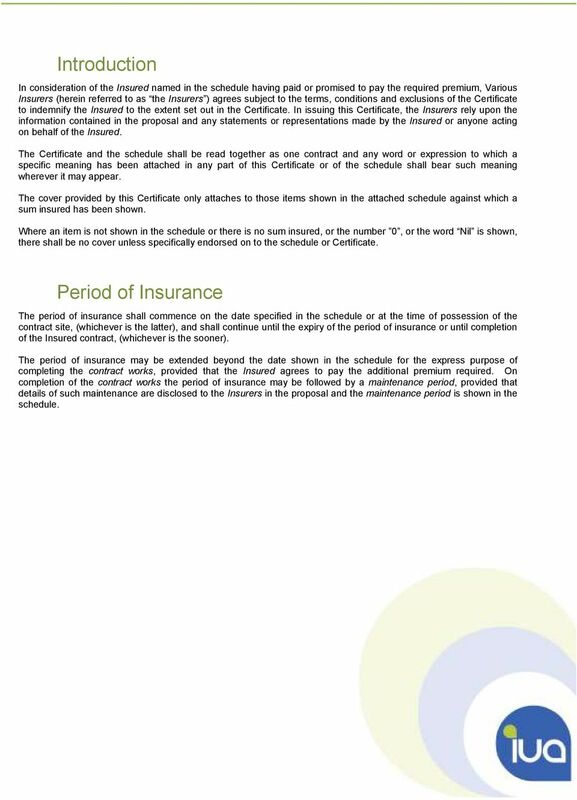 The cover provided by this Certificate only attaches to those items shown in the attached schedule against which a sum insured has been shown. Where an item is not shown in the schedule or there is no sum insured, or the number 0, or the word Nil is shown, there shall be no cover unless specifically endorsed on to the schedule or Certificate. Period of Insurance The period of insurance shall commence on the date specified in the schedule or at the time of possession of the contract site, (whichever is the latter), and shall continue until the expiry of the period of insurance or until completion of the Insured contract, (whichever is the sooner). 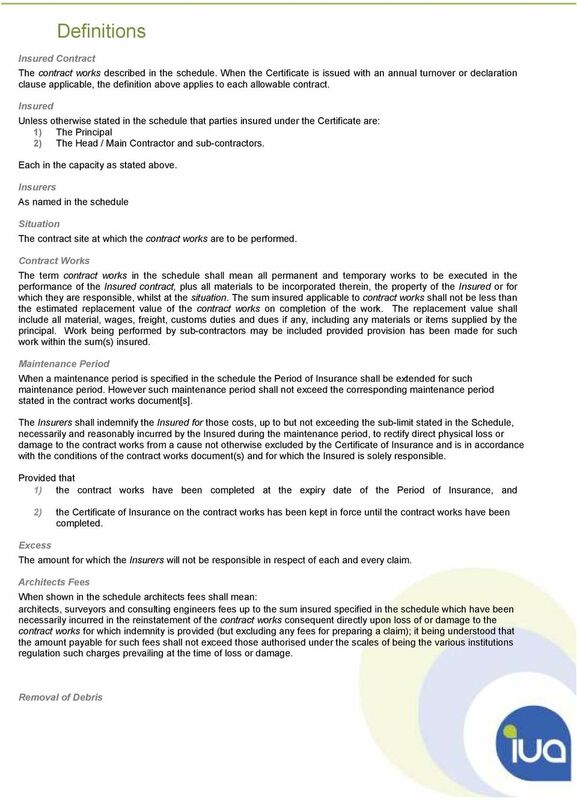 The period of insurance may be extended beyond the date shown in the schedule for the express purpose of completing the contract works, provided that the Insured agrees to pay the additional premium required. 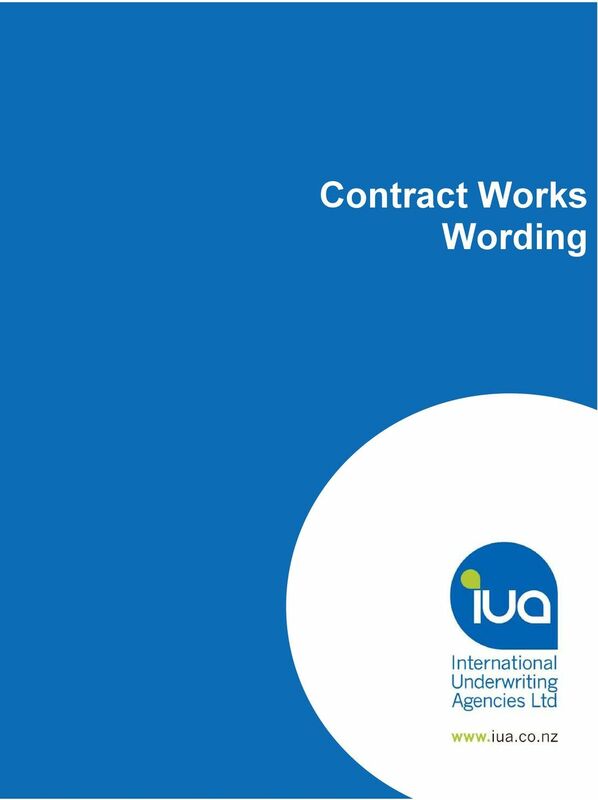 On completion of the contract works the period of insurance may be followed by a maintenance period, provided that details of such maintenance are disclosed to the Insurers in the proposal and the maintenance period is shown in the schedule. 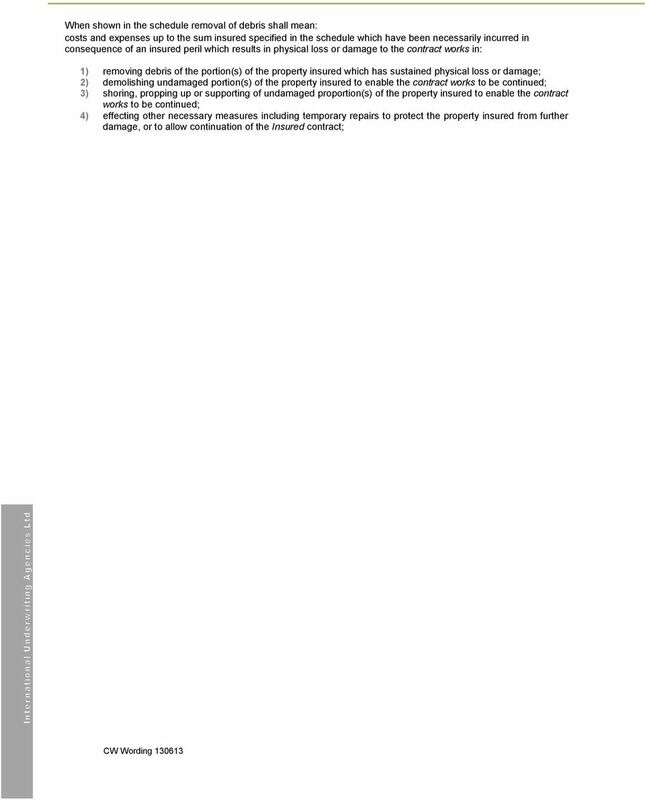 7 Exclusions The Insurers will not indemnify the Insured against: 1) loss or damage directly or indirectly caused by earthquake, hydrothermal activity or volcanic eruption unless as otherwise stated in the schedule and the appropriate premium being paid or agreed to be paid as per the earthquake rating scale of the main property section; 2) loss of damage to any item of machinery or plant, which has been installed as part of the Insured contract, directly caused to that item by its testing or commissioning. 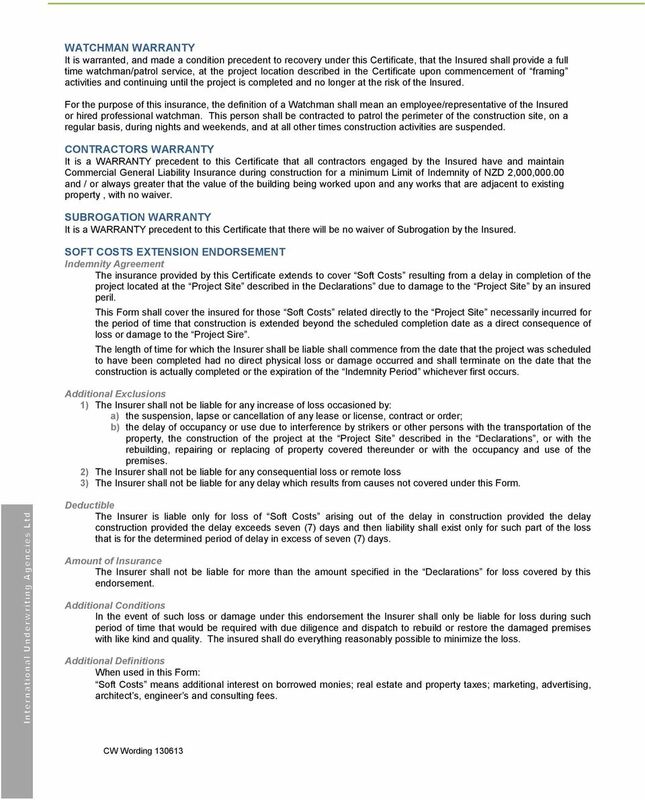 However, this exclusion shall not apply to new building services plant forming an integral part of new buildings being constructed and insured by this Certificate, unless such plant is more specifically insured by the sub-contractor(s); 3) consequential loss, loss of use, loss due to delay, penalties, fines, liquidated damages, aggravated, punitive or exemplary damages, or liability of any nature whatsoever. 4) loss or damage to property directly caused by cessation of work whether total or partial; 5) the cost of repairing, replacing or rectifying any part of the contract works in which there is a fault, defect, error or omission in design, plan or specification. However, this exclusion shall only apply to that part of the machine or structure immediately affected by such fault, defect, error or omission. 6) the cost of repairing, replacing or rectifying any part of the contract works which is defective in material or workmanship. 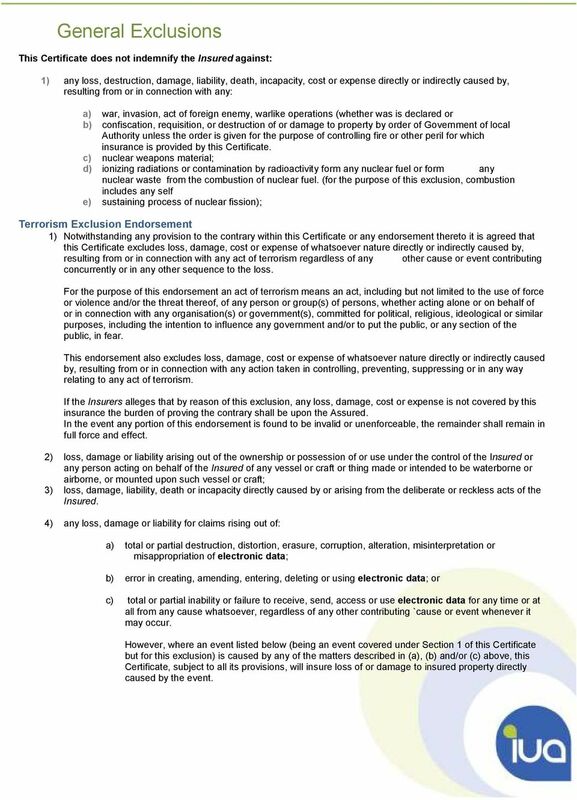 However, this exclusion shall only apply to that part of the machine or structure immediately affected and not to loss or damage to other parts of the contract works resulting there from; 7) loss of damage to: a) any employees tools and equipment unless otherwise agreed by endorsement; b) any item of contractors plant. 8) loss or damage caused by wasting, wearing away, discolouration, staining, aesthetic defects, delamination, corrosion, erosion or gradual deterioration, including that due to atmospheric conditions; 9) loss or damage arising out of or resulting from rot, mould, mildew, fungi; 10) loss or damage to accounts, bills, bonds, currency, stamps, deeds, evidence of debt, money, notes, securities, cheques, credit cards, files, computer software, drawings and plans. 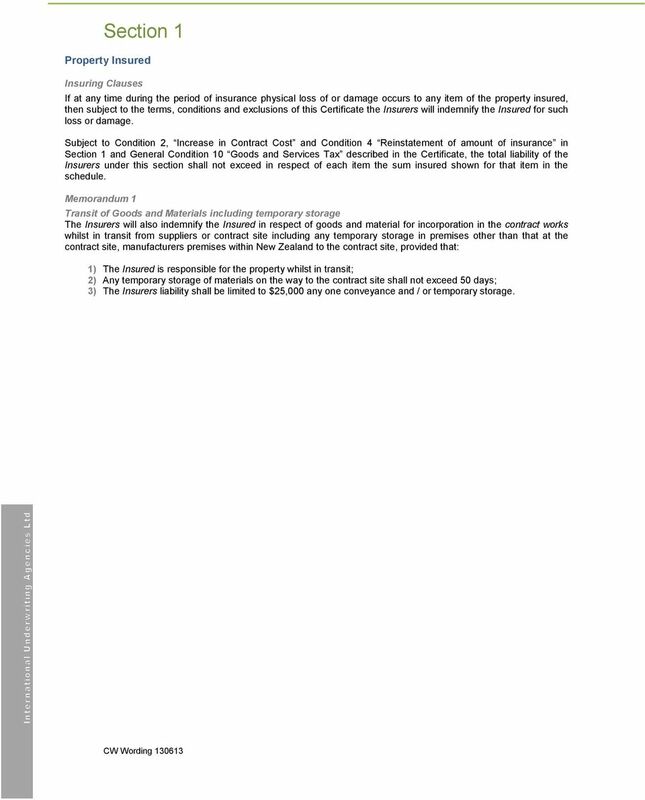 11) loss of any property by disappearance or shortage revealed only by the making of an inventory or by periodic stocktaking, and where such loss is not traceable to any specific event; 12) loss or damage to the contract works or any part thereof which has been taken into use or occupation by the principal, unless such loss or damage occurred during any maintenance period specified in the schedule and arose in the course of any operations carried out by the contractor solely for the purpose of complying with the stated obligations under the maintenance clauses of the contract; 13) loss or damage to any existing structures belonging to the principal, unless such loss or damage occurred to property specified in the schedule which forms part of the Insured contract and arose directly out of the performance of the Insured contract; 14) loss or damage arising out of rectifying existing or aggravated defects not forming part of the Insured contract; 15) The excess shown in the schedule which shall be the amount borne by the Insured in respect of each and every claim for which indemnity is provided under Section 1. 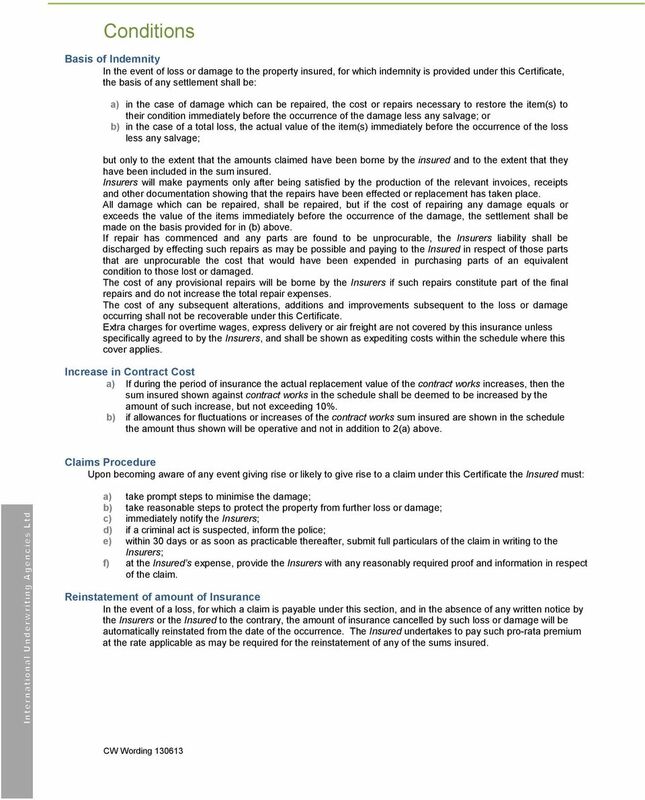 For the purposes of this exclusion: a) a series of events arising from or caused by subsidence, erosion, flood, inundation, landslip, cyclone, storm or tempest during any period of 72consecutive hours will be treated as one event for the purposes of applying the excess; b) the excess shown as applying to contract works shall be applicable to architects fees and removal of debris. In the event of a loss arising from the same source and original cause giving rise to a claim against more than one of these items, the excess will not be cumulative. The aggregate adjusted loss will be subject to the highest excess only being applied. 9 General Exclusions This Certificate does not indemnify the Insured against: 1) any loss, destruction, damage, liability, death, incapacity, cost or expense directly or indirectly caused by, resulting from or in connection with any: a) war, invasion, act of foreign enemy, warlike operations (whether was is declared or b) confiscation, requisition, or destruction of or damage to property by order of Government of local Authority unless the order is given for the purpose of controlling fire or other peril for which insurance is provided by this Certificate. c) nuclear weapons material; d) ionizing radiations or contamination by radioactivity form any nuclear fuel or form any nuclear waste from the combustion of nuclear fuel. 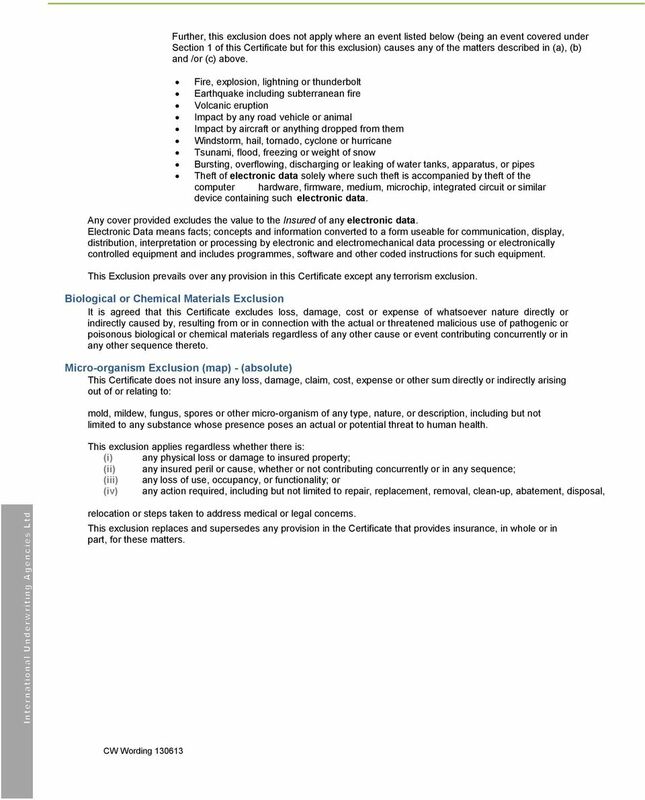 (for the purpose of this exclusion, combustion includes any self e) sustaining process of nuclear fission); Terrorism Exclusion Endorsement 1) Notwithstanding any provision to the contrary within this Certificate or any endorsement thereto it is agreed that this Certificate excludes loss, damage, cost or expense of whatsoever nature directly or indirectly caused by, resulting from or in connection with any act of terrorism regardless of any other cause or event contributing concurrently or in any other sequence to the loss. For the purpose of this endorsement an act of terrorism means an act, including but not limited to the use of force or violence and/or the threat thereof, of any person or group(s) of persons, whether acting alone or on behalf of or in connection with any organisation(s) or government(s), committed for political, religious, ideological or similar purposes, including the intention to influence any government and/or to put the public, or any section of the public, in fear. This endorsement also excludes loss, damage, cost or expense of whatsoever nature directly or indirectly caused by, resulting from or in connection with any action taken in controlling, preventing, suppressing or in any way relating to any act of terrorism. If the Insurers alleges that by reason of this exclusion, any loss, damage, cost or expense is not covered by this insurance the burden of proving the contrary shall be upon the Assured. In the event any portion of this endorsement is found to be invalid or unenforceable, the remainder shall remain in full force and effect. 2) loss, damage or liability arising out of the ownership or possession of or use under the control of the Insured or any person acting on behalf of the Insured of any vessel or craft or thing made or intended to be waterborne or airborne, or mounted upon such vessel or craft; 3) loss, damage, liability, death or incapacity directly caused by or arising from the deliberate or reckless acts of the Insured. 4) any loss, damage or liability for claims rising out of: a) total or partial destruction, distortion, erasure, corruption, alteration, misinterpretation or misappropriation of electronic data; b) error in creating, amending, entering, deleting or using electronic data; or c) total or partial inability or failure to receive, send, access or use electronic data for any time or at all from any cause whatsoever, regardless of any other contributing `cause or event whenever it may occur. 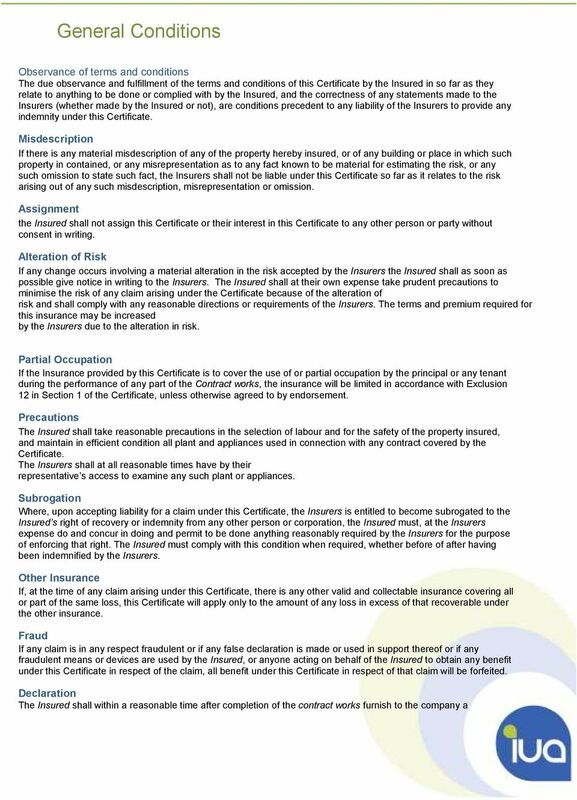 However, where an event listed below (being an event covered under Section 1 of this Certificate but for this exclusion) is caused by any of the matters described in (a), (b) and/or (c) above, this Certificate, subject to all its provisions, will insure loss of or damage to insured property directly caused by the event. 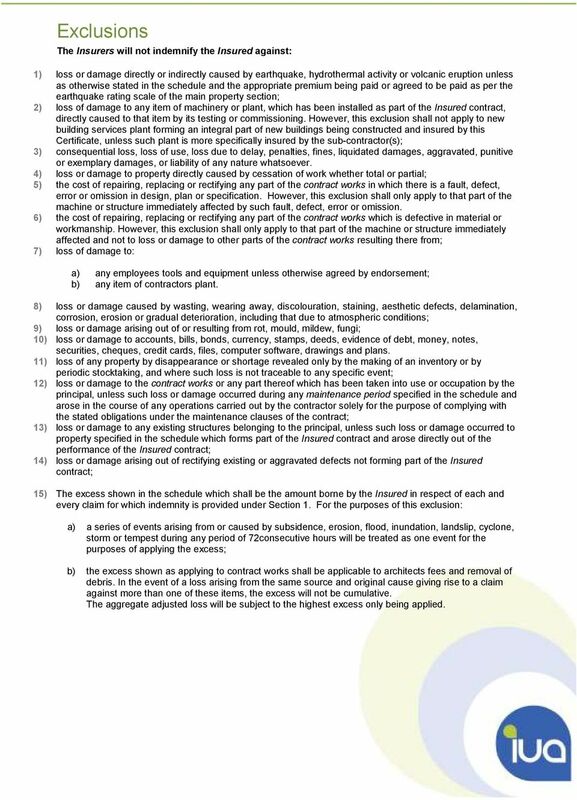 13 Warranties HOT WORK OPERATIONS WARRANTY IT IS HEREBY UNDERSTOOD AND AGREED that: This Insurance does not apply to Property Damage arising out of Hot Work Operations if the Insured or any of the Insured s employees is in breach of any of the following warranties. 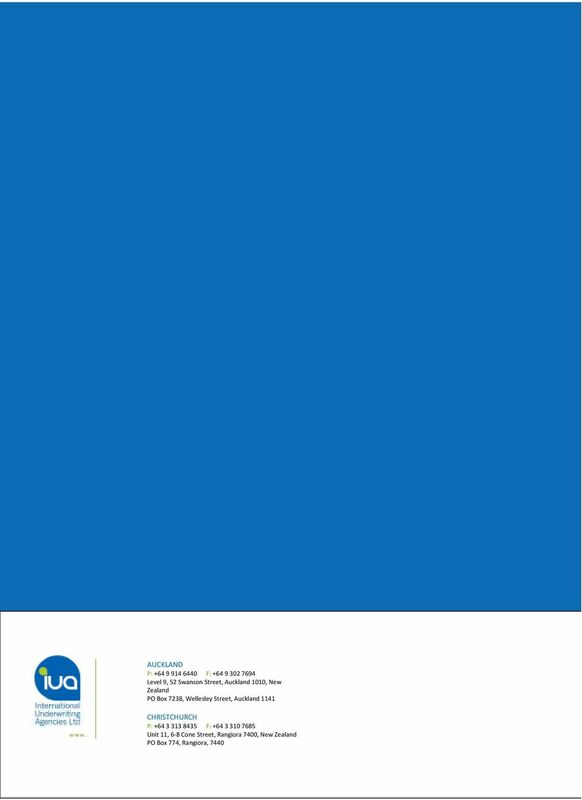 1) Combustible Material: All portable combustible material must be removed a minimum of 20 feet away from the working area and adjoining areas. 2) Flammable Liquids or Vapours: Drums, tanks or other containers or explosive liquids or vapours must be cleaned and cleared of flammable or explosive liquids or vapours before work is done on them. 3) Pre-Operation Precautions: When feasible, work area should be wetted down. 4) Spark Control: Sheet metal guards, asbestos blankets and similar protection must be provided to prevent hot metal and sparks from falling on combustible material which cannot be moved. 5) Fire Protection: If the area in which hot work operations are being performed are presently under operative sprinkler protection, the sprinklers in that area must be operative during welding or cutting operations. Suitable fire extinguishers or hand hose must be maintained near the operations, an extra person must be provided in the welding or cutting team whose sole responsibility is to watch for sparks and promptly use the extinguishing equipment. 6) Post-Operation Precautions: After work, a thorough check must be made for smouldering fire in out-of the-way places, and guard patrol protection must be maintained for a minimum of four hours. Hot Work Operations means: a) the process whereby one or more of the parts to be joined is heated near or above its melting point, and the heated surfaces are caused to flow together; b) the process of applying heat to red heat the spot to be severed, gouged or pieced, and the metal is burned in a jet of oxygen; c) grinding operations that generates sparks; d) torch-on roofing operations; e) roof tarring operations. OPEN FLAME HEATING WARRANTY It is warranted that during the course of construction of the Insured Project where a propane gas heater or other open flame heating device is used; the device will be positioned on fire resistive dry wall board, tied off to a wall or floor with not less than three (3) feet of clear space surrounding it. FAILURE TO COMPLY WITH THIS WARANTY SHALL RENDER ALL INSURANCE UNDER THIS CERTIFICATE NULL AND VOID. 15 Indemnity Period means the period beginning with the date that the project was scheduled to be completed and is limited, in addition to those provisions set out in this endorsement, to twelve (12) consecutive calendar months, but this shall not be limited by the expiration of the Certificate period. CONSTRUCTION PROJECTS GENERAL CONDITIONS 1) Adequate fire fighting equipment and sufficient extinguishing agents are available and operate at all times. 2) Access Roads to be able to allow fire trucks to enter the site and access all fire hydrants prior to the start of framing. 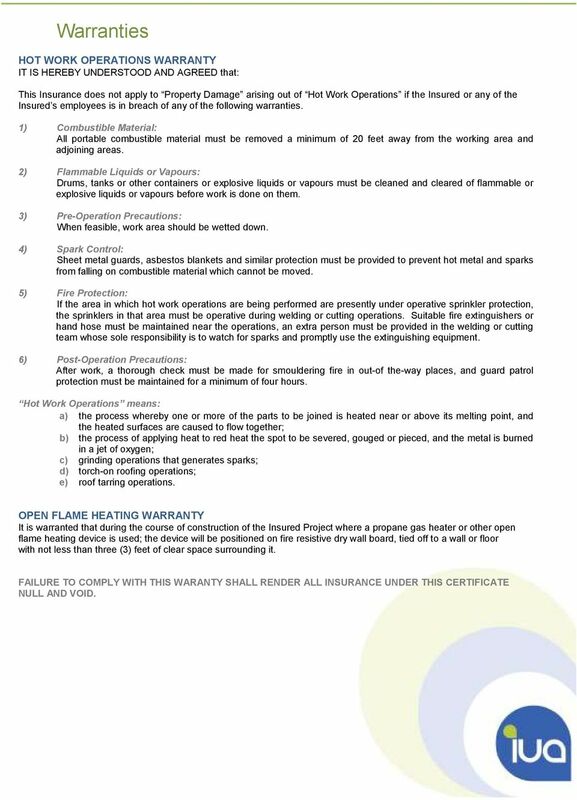 3) All private hydrants to be operational prior to the start of framing activities. 4) There shall be no storage of building materials on the roads. REFUSE, WASTE AND DEBRIS WARRANTY It is hereby warranted that there shall be no refuse, waste or debris burned at the construction site. Refuse, waste and debris to be removed regularly from the site. FAILURE TO COMPLY WITH THIS WARRANTY SHALL RENDER ALL INSURANCE UNDER THIS CERTIFICATE NULL AND VOID. FENCE WARRANTY It is hereby warranted that the entire site is fenced with a fence that has a minimum height of 2 metres and access is controlled. FAILURE TO COMPLY WITH THIS WARRANTY SHALL RENDER ALL INSURANCE UNDER THIS CERTIFICATE NULL AND VOID. CONSTR '! 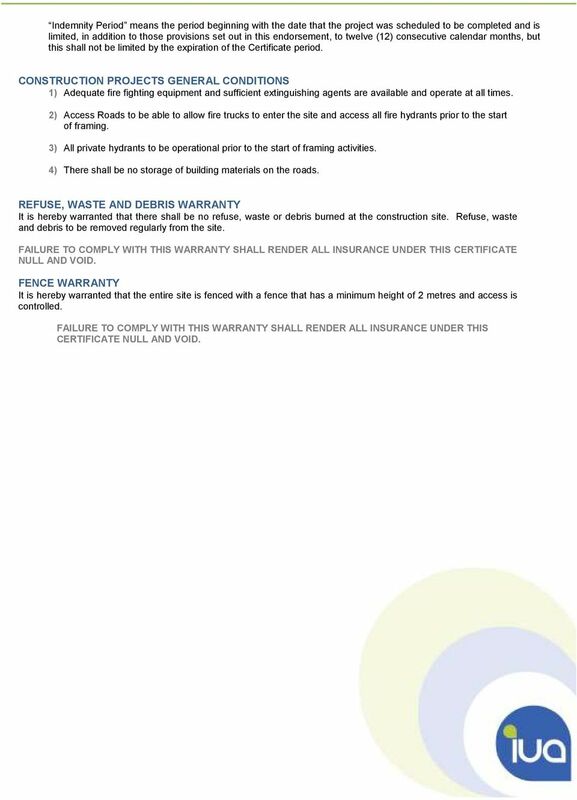 : N INSURANCE- =:] Wrap-Up Liability Builders Risk Please complete general information section for all pro j ects and specific sections for wrap-up Liability and builders risk according to requirements. 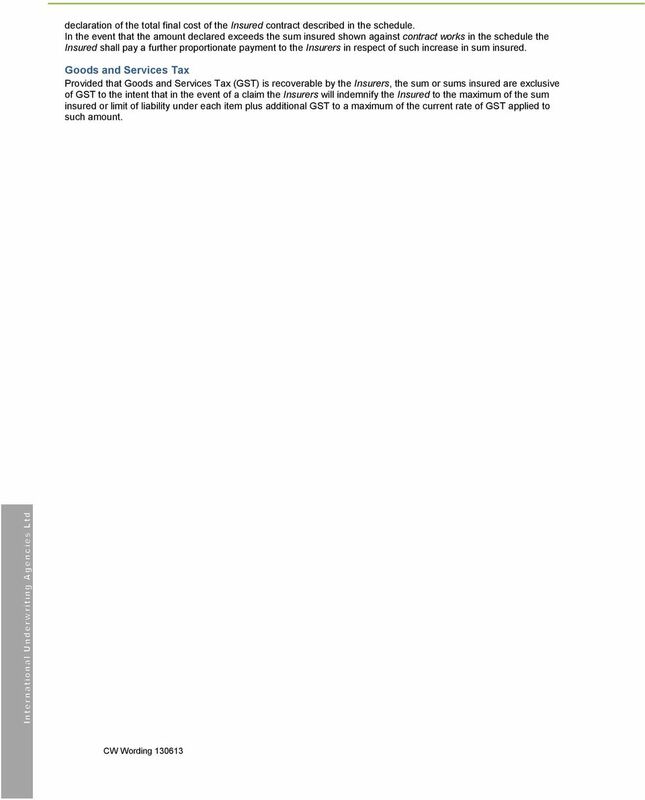 Comprehensive project (CP) insurance Policy No. Contractors all risks policy No. MONEY POLICY. This Policy is evidence of the contract between the Insured and the Insurers.